1. Preheat the grill to medium-high. 1. Clean portabella caps. Brush with olive oil and sprinkle with salt and pepper. 1. Brush the grill grate with oil. Place mushrooms on the grill and grill for 5 to 7 minutes on each side or until tender. 1. In a small mixing bowl, combine Gorgonzola and mayonnaise and stir well to combine. Spread about ¼ the mixture onto each hamburger bun. 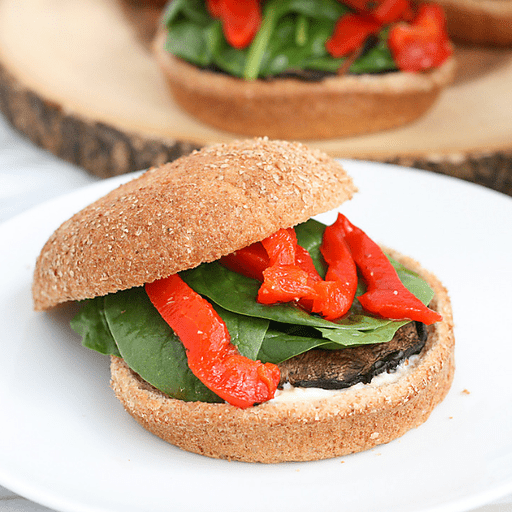 Top each hamburger bun with 1 mushroom, ½ cup spinach and 2 Tbsp. red peppers. Use arugula in place of spinach. For gluten free: Use gluten free buns in place of whole grain hamburger buns. Calories 300, Total Fat 15g (Saturated 3.5g, Trans 0g), Cholesterol 10mg, Sodium 430mg, Total Carbohydrate 33g (Dietary Fiber 4g, Sugars 8g), Protein 9g, Vitamin A 50%, Vitamin C 30%, Calcium 10%, Iron 15% *Nutritional values are an approximation. Actual nutritional values may vary due to preparation techniques, variations related to suppliers, regional and seasonal differences, or rounding.